Better known as the Paradijskerk (paradise church), this monumental edifice is partly hidden away behind the houses on Nieuwe Binnenweg, but commands attention with its two 41 metre high neo-baroque towers. 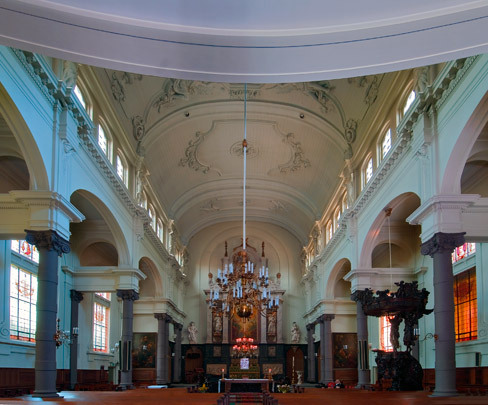 The magnificent baroque interior comes from the original clandestine church (schuilkerk) of 1718 on Delftsevaart. The district had gone into such decline that the restoration work required by this church was cancelled in favour of building a new one at a new site. The old altar front, communion bench, organ cabinet and pulpit had been designed and built between 1720 and 1725 by A.D. Pluskens, a master woodcutter from Antwerp. The decision to move the interior and the organ to the present church saved them from destruction during the German bombing raid of May 1940.